Children’s play pool is open from May 3 through 5 for kids from 3 to junior high age. Southeast Botanical Gardens in Chibana, Okinawa City, has been a fixture as a central Okinawa sightseeing spot for decades. Over the years it has seen its ups and downs, but after the Tapic Group, a company that runs hotels and medical care and elderly care facilities, renovated and reopened the facility in 2013 after being closed for two and half years, the renowned gardens has seen a strong rebirth. Fishing is one of the attractions during the Golden Week. The garden is home to over 30,000 specimens of 1,300 species of trees and shrubs, rare and exotic plants, and colorful flowers. As a part of its revitalization, the Southeast Botanical Gardens offers various learning programs from kids to grownups. 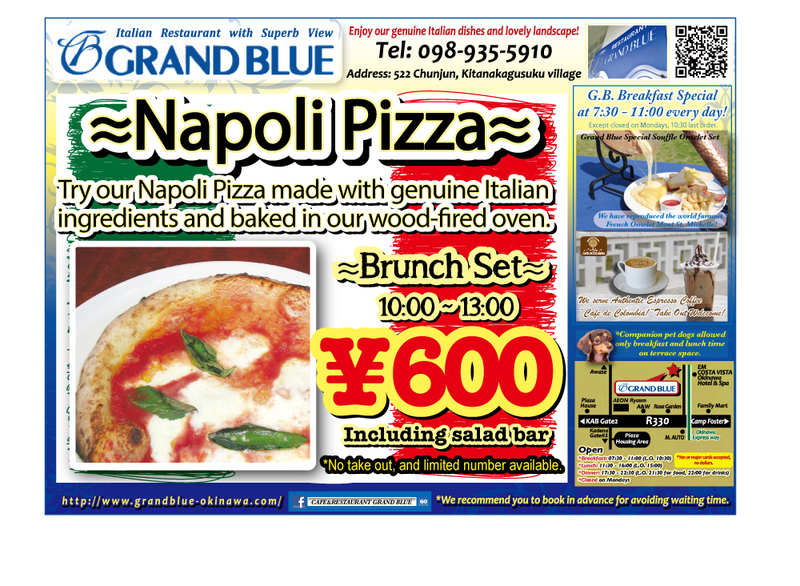 The Golden Week, the biggest Japanese holiday period is from Apr. 29th through May 8th. 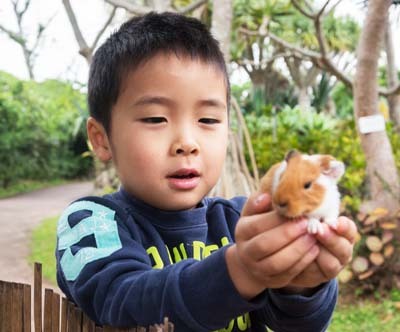 The Southeast Botanical Gardens is organizing a special family event for the holiday that includes a bouncy slide and petting zoo each day from 10:00 to 17:00. During the holiday, visitors can bring their own lunch, drinks, snacks and leisure goods for their family picnic if they so like, or have a family meal at the garden restaurant. Instructors show how to make an insect cage for cicadas for the cost of ¥200. 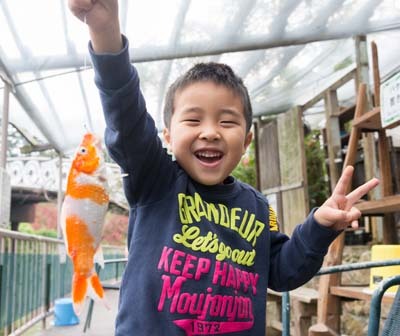 Other activities guaranteed to entertain the whole family include fishing from 10:00 to 16:30 at Takonoki Station for only ¥300, which also has goldfish scooping from 10:00 to 17:00 for ¥300. 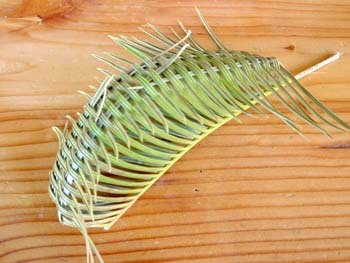 Toramu Station workshop instructs how to make an insect cage for cicadas for ¥200. Another workshop teaches how to make raised and padded pictures on cloth for ¥200. 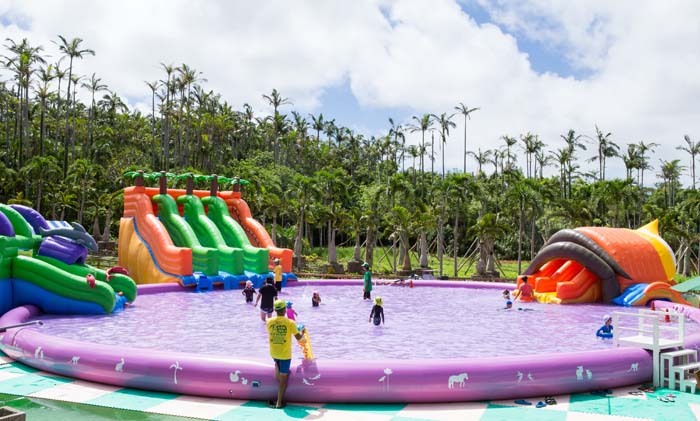 Other attractions include a giant children’s play pool for children from three to junior high school age, open depending on weather, at the Paradise Park. The pool is operating only from Apr 29th through May 8th from 10:00 to 17:00. Tickets are ¥100. Petting zoo has lost of cuties. Toramu Station also has cart rides for ¥500 per person. Let’s play Kinetic sand is made in Sweden and looks like clay. Some people call it ‘dancing sand’ because it looks like it’s moving and dancing all the time. The playtime for the sand costs ¥100, and is from 10:00 to 17:00 with the last admission 16:30 at Partnership. The admission for the Golden Week events is ¥1,500 for adults, ¥1,000 for high school students, ¥500 for junior high and elementary school students. Children under 6 years of age can enter free.